I’m delighted to be wearing a vanilla fragrance on any day. As much as I love Jasmine and honey, the vanillas keep me coming back. Up today is M. Micallef‘s Vanille Marine, a pretty aquatic with a bite of citrus and a smooth vanilla personality. In Bottle: Sharp citrus and marine with a tempering of flowering vanilla. It’s quite an interesting mix of sharp and soft that forms to make a fairly nice fragrance. Applied: I get an initial spear of citrus and sharp marine notes. It makes the scent smell quite strong and reminds me a lot of soap. While the opening might be harsh, Vanille Marine settles down quickly into a softer interpretation lending much of this progression to the florals and that awesome vanilla. I had my reservations about an aquatic vanilla fragrance. I hadn’t tried any before that I thought worked out very well, but Vanille Marine makes the concept very appealing. There’s a clean edge to this from the marine that mixes well with the soft floral vanilla. It makes me think of delicate vanilla flowers floating in the ocean. This is clean, fresh and warm all at the same time as you settle into its mid-stage. Where Vanille Marine gets really good is near the end where the marine notes have time to settle into the skin and work with the vanilla to give off this beautiful smooth vanilla and aqua fragrance. Extra: M. Micallef’s vanilla collection showcases the many faces that vanilla can take. I’m extremely happy that fragrance houses are using vanilla in different ways than the standard recipe of throwing it into a gourmand or spraying it all over the base notes of some fruit floral and hoping for the best. I never thought an aquatic vanilla could work out this well, and I’m happy to be proven wrong. Design: Vanille Marine is packaged and presented in much the same way as Vanille Orient. I’m still not a big fan of the aesthetics and think Micallef’s other work is more attractive. Still, the bottles and the design are nice interpretations of fun, natural and organic aesthetic. Notes: Lemon, blackcurrant, marine, vanilla, white florals, benzoin, musk, woods. I though Vanille Orient would be my favorite from this batch of vanillas, but I’m thinking Vanille Marine might have it beat. I’ve smelled a lot of good oriental vanillas and while Vanille Orient is up there on the list, Vanille Marine was a pleasant surprise. Reviewed in This Post: Vanille Marine, 2012, Eau de Parfum. Escada’s fragrances have never struck much of a chord with me. The ones that are popular are pretty generic, the more obscure ones are just not my thing. So here comes another generic! In Bottle: Island Kiss starts off predictably enough with a fruity blast up my nose of clean tropical mango and other girly sweet fruits. Applied: There’s a slight layer of sweet white florals in the opening that I’m detecting on me along with the fruits. I smell the fruits the most though with mango making the biggest splash followed by a sweet peachy note. Most Escada fragrances tend to go like this, big fruity openings evolving into bland floral mid-stages and going on some sheer note like white musk or sandalwood. And from the looks of things, Island Kiss will continue the tradition. The mango and sweet fruity opening of the fragrance leads way to an equally sweet floral mid-stage that’s a bit better than Marine Groove in terms of strength but it’s still quite benign, quite easy to wear, and when Island Kiss reaches its dry down the same sheer ending is waiting for me in a cleaned up sandalwood and sharp white musk. Aside from Island Kiss having some more fruits up in the opening with a hint of floral layering, there’s not a whole lot to set this fragrance apart from Marine Groove or any of the other fruity florals that Escada’s released. If you want to smell like girly, fruity, fun shampoo, Island Kiss is a good start. It’s clean, it’s modern, it’s easy to wear and it smells like fun. Extra: Island Kiss was released in 2004 and was supposedly inspired by the Greek islands. Frankly, it is interchangeable with most of Escada’s summer line. Design: Same bottle shape as the other summer line Escada fragrances. That stretched heart thing with the gradiating color on the glass. In Island Kiss’ case, the gradient goes from blue to a pink base. Notes: White florals, magnolia, mango, passion flower, orange, passion fruit, raspberry, white peach, hibiscus, musk, sandalwood. Island Kiss is one of the better ones from the summer line. That’s not really saying much since choosing between the Escadas in their summer line can pretty much boil down to which top note you want to smell first. You want mango? Island Kiss. You feel like pineapple? Marine Groove. Big on pears? Get Tropical Punch. 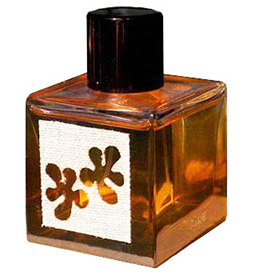 Reviewed in This Post: Island Kiss, 2004, Eau de Toilette. Ribbon’s last in this line of Lollipop-related perfumery. It’s supposedly the one that smells the most like candy. And I gotta say, judging by the notes and the wear on me, it pretty much delivers. In Bottle: Sweet, sugary, clean, a touch of sweet raspberry note to give this some sort of smell. It’s pretty much like smelling a lollipop, I’ll attest to that. Applied: Sweet raspberry lollipop smells hangs out for about five minutes before it ebbs and goes into an equally sweet berry dominated white floral fragrance. Smells very generic but not unpleasant, more pleasant than Mine Again as I can imagine Ribbon being an easier wearing scent. It’s got its notes in the right place but there is absolutely nothing grabbing me in the mid-stage for this stuff. The dry down is equally uninteresting as I’d like to note all three Lollipop Bling scents had disappointing dry downs . The end stage for Ribbon, for example, is barely even there with a sugary fruity floral fade that smells pretty much the same as it did in the mid-stage. Extra: So there you go, all three Lollipop Bling offers and they were all kind of disappointing. Ribbon’s the second place winner here, Honey is first, Mine Again I wish I could forget. Design: Ribbon is bottled in a pink glass that gradients upward into blue. The shape and style is similar to its sisters, Honey and Mine Again in that they all base their shape off of M by Mariah Carey. Notes: Sugar, raspberries, white florals. Ribbon, like its sisters just sin’t worth it. 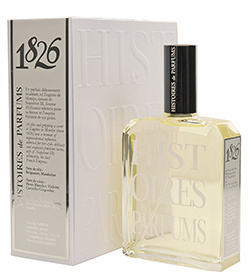 You are better off getting more complex scents t hat did these genres of fragrance better. For Honey, I recommend G by Harajuku Lovers. For Mine Again try Fantasy by Britney Spears or even Vera Wang Princess if you liked the chocolate. For Ribbon? Well, you might as well go for any celebrity fruity floral as this one is hardly remarkable. Reviewed in This Post: Ribbon, 2010, Eau de Parfum. Reviewing Lollipop Bling after last week’s classic perfume review-a-thon is like attending an opera then going home and watching reality TV. There’s really no graceful way to segue from one to the other but I review what I have in my notes as I smell things. Some days I might go through five or six perfumes. Some days none. Then there are weeks like this and the Chanel week earlier this month where I yaw between the sensual, dirty romance of Jicky and Mariah Carey sitting on a pink cloud. Applied: After the pineapple hello, Honey evolves into a warmed up honey pineapple treat that makes me think of the tropics. The tropics being an interesting muse for recent perfume releases. I’m happy to see there is actually honey in this but I find myself having to focus on finding it as it is buried under the giant fruity balloon that rubbed itself onto a field of unsuspecting flowers before it floated off. I don’t think much of Honey. I don’t like it much. It’s far too simple, lacking in imagination and I can’t even enjoy it for its sheer fun factor because this has been done before and so much better. If you were going to go for Honey, go for the better version of this concept in G from Harajuku Lovers. Unless you hate coconut, then you might as well go Independent and score yourself a bottle of Rangoon Riptide from Black Phoenix Alchemy Lab. I know it was a limited edition but at least you get more than this. This is just too simple to be any good. It makes me beg the question why I should care about it when there’s better stuff out there for the same price point. I smell three notes (pineapple, honey, flowers) for a period of an hour and then it devolves into that watered down, miasma of florals, “something sweet used to be here but died”, perfume scent that I hate so much. Extra: Honey is a part of Mariah Carey’s (read: Elizabeth Arden’s) Lollipop Bling perfume collection. The collection is notably styled after M by Mariah Carey, only simplified to the barest essentials. Design: There are three perfumes right now in the Lollipop Bling collection and Honey is identified as the yellow one. It’s a yellow glass bottle with a butterfly cap on top. Reminds me a bit of the butterfly bottles from Annick Goutal, only much clunkier and obviously designed to appeal to a much younger audience. Notes: Pineapple, white florals, honey. I can’t say Honey brings anything new to the table when it comes to tropical scents as we already had Desire Me by Baby Phat, G from the Harajuku Lovers collection, and Bath and Body Works’ Pineapple Orchid that doesn’t come in perfume form but if it did, I’m sure it’d be popular. After all that, do you really need another perfume that makes you smell like pineapples? Reviewed in This Post: Honey, 2010, Eau de Parfum. 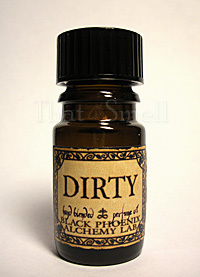 Dirty, from Black Phoenix Alchemy Lab is a purposefully ironic interpretation. Dirty, supposedly smells like soap and general cleanliness. Miles away from the gritty undertones of its name, Dirty is a flowery bar of soap sitting on the windowsill wafting in the cool breeze of a manicured garden. In Bottle: Something very sweet in this. Sweet and floral this can’t be a single clean linen scent because it also contains what I swear is white floral and sweet herbs. It makes me think of fresh, white sheets blowing in the breeze and an opened window. Applied: Definitely something sweetly floral in this. It reminds me of Bath and Body Works‘ Sweetpea and Cotton Blossom mixed into one. There’s a great sense of imagery in this fragrance though. I mentioned the clean laundry, the window, how about a little house in the Maritimes with the rolling sea crashing against a cliff edge’s jagged skirt hem? Yeah, that’s it. Dirty starts off with that sweet floral aroma and eventually dries down to subtle soap and clean cotton. It’s like a bath and a change of clothes during midday. Extra: There’s been some speculation abound about whether or not BPAL uses all natural ingredients or if there’s some synthetics mixed in there. I would suggest you ask the company yourself if this concerns you. As far as my nose goes, BPALs are fun and simple fragrances. If they’re safe to use then whether they’re all natural or synthetic is of no consequence to me. Notes: Sweet herbs, white florals, cotton. Dirty has an interesting case study. It delivers everything it needs to. I find myself conjuring up more vivid images in association with natural perfumes than constructed ones. That isn’t to say I don’t love the constructed ones or they’re somehow less effective. What tends to happen is natural perfumes make me think of scenes, landscapes, sounds and events. 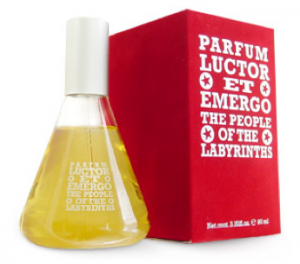 Constructed perfumes make me think of people and the cultures that they reflect. Reviewed in This Post: Dirty, 2009, 5ml Bottle.